Fall greetings to all! This new release has been a bit of a struggle to produce. Too much day job overtime and too much illness have meant too little time to make pretty things. A few things are better than no things though and they were fun to create even if they arrive a month and a day later than originally intended. We would like to say that there will be another small release for December, but circumstances will likely be similar and we have some very labor intensive private commissions to finish so we are not certain that time will allow. We will send out the next newsletter when we have more pieces ready to sell. The November release includes a small selection of necklaces in a variety of styles, two rings and a sleek modern bracelet. Three necklaces were made for the big boys: a glossy hematite choker, an earthy kyanite and stone choker, and a sparkling sterling and garnet chain. 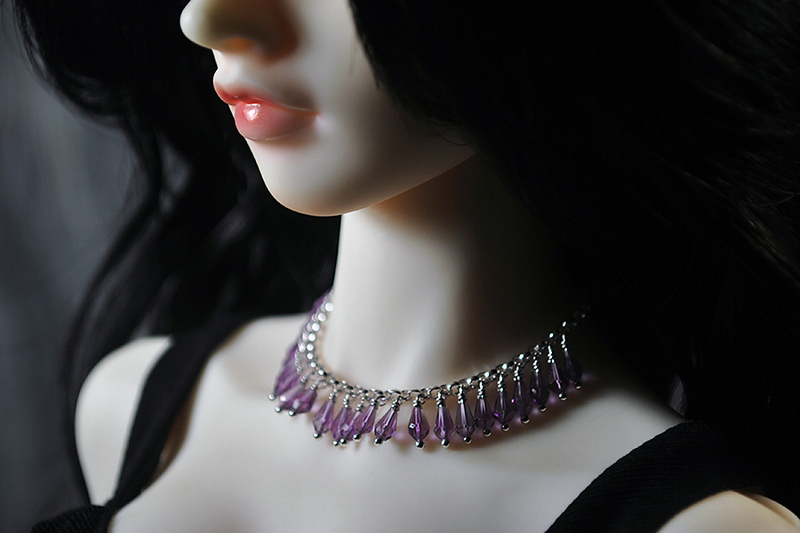 The other three necklaces are more elegant and feminine in style and feature bright pink rubies, a Swiss blue topaz and a decadent number of faceted amethysts. We have discovered some marvelous slender Italian velvet cord that is very strong, does not shed or stain and is made in many beautiful colors, so we hope to use it in more pieces in the future. Please note that the rings up for auction this month have a very specific fit: the garnet ring is shaped precisely to fit 70cm Dollshe boys and the spiral ring is a better fit for the smaller Delf boy fingers. We did not call in any of the local elder iplehouse boys to model the extra large necklaces this month, but we do have a very special guest model featured in the release. SDink’s Volks F-38 SD17 boy Keane has been hanging around getting spoiled for a few weeks, so we put him to work. Please enjoy the extra eye candy! Speaking of eye candy, more pieces from the past have been added to all five of the elemental galleries for your perusal. As always, if there are jewelry styles from our gallery that you hope will become available again in the future, please let us know!